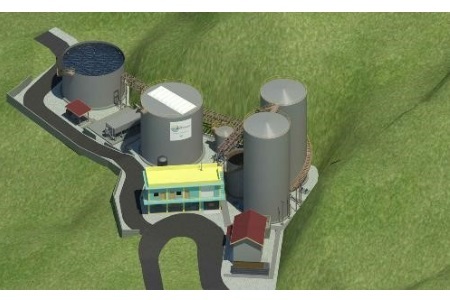 Cervecería Centro Americana (CCA), a brewery located in Guatemala, is enhancing its environmental performance by using Global Water & Energy (GWE) technologies to convert wastewater into biogas while achieving effluent quality improvements of 97% in organic matter removal. A SUPERSEP-DF downflow solids separator, which provides efficient counter-current sludge separation, combined with co-current sludge evacuation. It is ideal for processing fragile organic sludge flocs. SUPERSEP-DF is designed to incorporate multiple cleaning possibilities during operation, including the backwash of individual rows of modules (manual or automated) and the removal of individual lamella modules for cleaning. An ANUBIX-T Expanded Granular Sludge Bed, which is ideally suited to medium-to-high strength wastewaters, with COD values of up to 25,000 mg/l. ANUBIX-T uses anaerobic purification to break down organic compounds and generate biogas. GWE’s ANUBIX-T has a smaller footprint than other anaerobic technologies and operating interruptions are minimized due to the absence of moving parts inside the reactor. A FLOTOX system, which incorporates a Moving Bed Biofilm Reactor (MBBR) and a SUPERFLOT solids separation system to polish the effluent aerobically from the ANUBIX-T reactor. Sludge separation will take place in the SUPERFLOT- AIR, a Dissolved Air Flotation (DAF) unit, instead of a clarifier. This will result in a more compact solids separation system, thus considerably reducing the footprint compared to a conventional clarifier. Sludge from the SUPERFLOT unit will be thickened, so the dewatering system will be even more economical and compact. An ODORIX Biofilter, which controls the odor and improves the working environment of the wastewater treatment plant by efficient degradation of the odorous compounds, organic acids, and hydrogen sulfide. The filter features a robust design and uses corrosion-free materials to optimize its operating life.